Latin which botanists qualifiers "hang" on this plant, doesn't differ in uniformity. To take, for example, the Apricot ordinary. One speak: "Prunus armeniaca" — also carry it to the sort Prunus of the family of Rosaceae. Others claim: "Armeniaca vulgaris" — also carry it to the sort Armeniaca (Apricot) in the same family. For the first option it is possible to find a support in similarity of "design" the kostochkovykh of fruits. The developed representation that to Europe Apricots from Armenia were delivered is the cornerstone of the second long ago (Alexander of Macedon, that is in the IV-th century BC). When politicians interfere with polemic, business even more gets confused. Residents of Armenia traditionally connect the beginning of spring with blossoming of apricot trees, at them is it is nationwide (though not legalized officially) a holiday. And the chairman of committee on an agrarian policy of Millie Medzhlis (the Azerbaijani parliament) Eldar Ibragimov in October, 2011 declared literally the following: "… here some years Armenians hold conferences, convincing all that the apricot is ancient Armenian fruit. 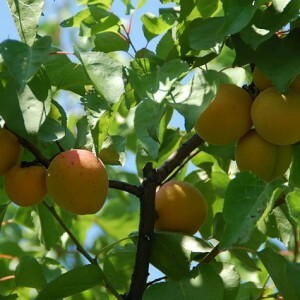 We have to prove that an apricot — ancient Azerbaijani fruit". Apricot. Apricot cultivation. Apricot variety.